Tool watch and tracking has never been more important in construction. Keeping watch over small tools and equipment can be challenging for any size contractor. Thankfully new technology and tool trackers are making this easier. Keep watch on your Tools! There are many ways to watch tools. There are also many tool watch and tool tracker software systems in the market today. ShareMyToolbox is different in that we are focused not on the process of scanning tools out from the warehouse to an employee. Instead, we are focused on enabling field personnel to transfer tools between each other. Certainly ShareMyToolbox can be used to assign small tools and equipment from the warehouse to employees. However, ShareMyToolbox is not an inventory system. It is a mobile tracking system that happens to maintain an inventory of small tools. Watching tools in the field is what this app was designed to do. If you need a simple tool tracker app read on! Tools are usually lost as they move from person to person or job to job in the field. Since your tools are mobile the software you use to track tools also needs to be mobile. The key to reducing tool loss is tracking the movement of tools from person to person. Most tool tracking systems operate like an accounting or inventory system, with a “check-in and check-out” approach to managing tools. ShareMyToolbox’s tool tracking app is different. It is built for the field first. It is built to help the field take responsibility for tools and the inventory in the office uses is a by product. To learn more about the ShareMyToolbox tool watch and tracking system please visit our Tool Inventory. Tool Watch, Tool Hound, Giga Track, Water Wheel. Tool Watch is an excellent full tool inventory system. Tool Watch does require much more effort to implement than ShareMyToolbox.Toolwatch. Tool Watch. Gigatrack. Giga Track. 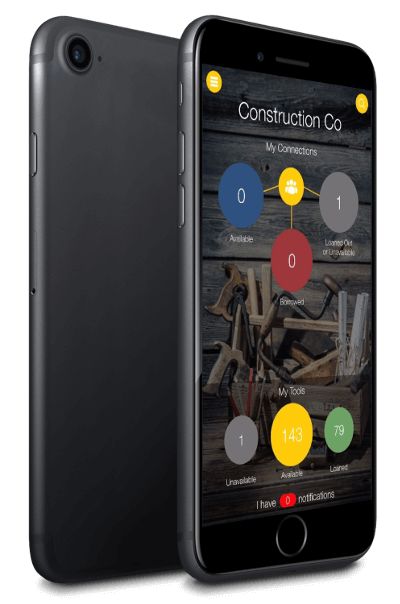 In modern construction companies a good tool tracker needs to be as mobile as the workers using it. In order to keep watch over small tools and small equipment a mobile tool tracker on your phone is the best option. More sales videos and demonstrations are available. To learn more about our tool tracking app please follow this link.